"Check your Gmail account without any web browser"
If you are constantly checking your Gmail inbox, because reading your mail in time is essential to your job, you know switching windows or opening your web browser every 5 minutes is just stressing. 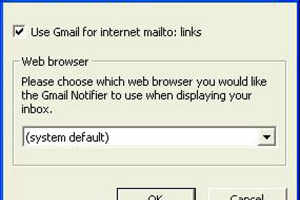 Gmail Notifier is a small application that allows you to check your Gmail inbox without having to use or open a web browser. This program will automatically notify you every time you receive an email, so you don't have to be guessing if you just got one. Gmail Notifier installs very easily and all you have to do after that, is to link your account. The application features a counter of unread messages, and will automatically shoot an alert sound when you receive a new email. Additionally, it also allows you to read your messages, mark them as read or unread, delete them, and even reply them. It supports IMAP connectivity over SSL, and you can even link multiple accounts. It is a really versatile application that will save you a lot of time.